Evidence that the recession is biting into Glasgow's squeezed middle classes emerged today after it was revealed that well-heeled shoppers in some of Glasgow's most affluent areas have been helping themselves to low-price items at city Tesco stores. 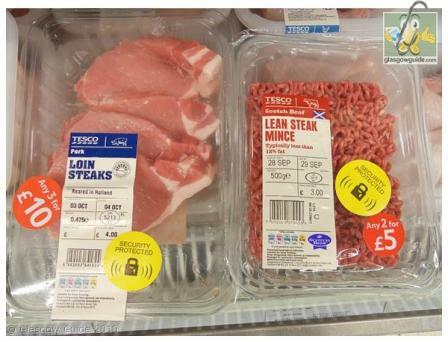 Tesco branches in affluent areas of the city, including Merchant City and Byres Road, have had to resort to putting electronic security tags on items such as bacon (£2) and mince (£2.50) after thefts of some meat products reached epidemic proportions. Such tagging measures have previously been reserved for higher-value and luxury items such as DVDs and televisions. "I am surprised and disappointed ... having to remove the security tag from your pork chop seems a bit excessive." "It is not a universal rule to tag raw meat products, and the decision would have been taken by managers at local level. For years certain products have always been tagged, [and] if any store has an issue with meat theft, action will be taken."  "Perhaps, due to the recession, those who can't afford to feed themselves are resorting to theft. Some people just can't afford to pay for things and these measures are a result of for that." 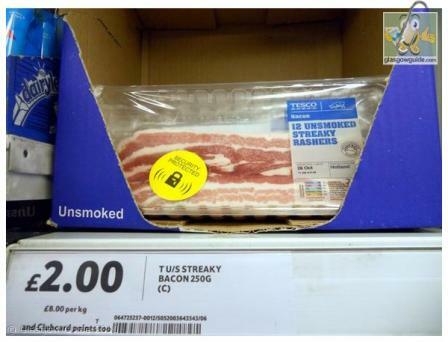 Meanwhile, just a few miles away in the Tesco store in the poorest constituency in the UK, Glasgow North East, the bacon remains tag-free ... for the time being! Yeesh! The brand of bacon I prefer goes for about £4.49, here in Florida. That is for a pound, though, which is about 453g. Still, That's pretty extreme to tag meat to prevent folks from nicking some of it. Tesco must be loosing a fair quantity of it to do this. means, by the time we see something, we've already passed through it. I object to your use of the word "just" in the polling question - what they steal the meat for isn't the issue - theft is theft! Oh ah love it Martin. The thought that those who can afford to live in the West End are the biggest villains. Mind you I must admit if I had no food for my children I think I would steal food too. Mibbe the West Enders should move to a less expensive area like the East End where the best people stay and the food may be slightly cheaper for them. Oh ye've really cheered me up this morning. I pay ¤1.90 for pack of 8 rashers (125g) which works out at more than thrice the price of cat food. Sorry Big Maus but times are hard hen. "The Duck steals the cat's ham!" Guess the report is nothin' new. Morning folks, thought for today, I have recently been astonished at the lack of customer care at tescos, the do not give a damm about loyalty, I will never shop there again as head office also did not give a fig. Morrisons are the height of customer care. It´s April 1st. right ? Or has the Daily Sport re-surfaced ? Definitely agree with RedSkyWalker ... theft is theft..
Back in the"good old days" - late 60s early 70s, Byres Road was one of my favourite hangouts.... in particular the Rock (a café on the road up to the University), but I remember that a lot of the flats in the zone were inhabited by students (definitely not an category with great purchasing power) ... is that no longer the case? I also remember the Rubiyat (spelling's probably wrong) and a couple of great Pakistani restaurants (I don't know what I'd give for a decent curry!!). There is no doubt in my opinion that the west end and in paticular the Byres Road was the place to be in the 60s and 70s.As youngsters my friends and I would frequent the various bars,the Ruby,The Byre,The Curlers,The Aragon at weekends and inevitably end up at some party in a students or more often a nurses flat in the vicinity.The place was just the cool place to be in Glasgow.Great. theft is indeed theft, whether it's a packet of bacon or a rolls royce the principle is the same. As a disabled ex serviceman trying to survive on the pittance I get from the DWP, I have never stolen or "Shop lifted" anything. byers rd 1976 these girls are now hosp managers etc "i am saying nuffing"
great days and nights , wots this to do with bacon !!!!! The two most popular items that people, usually drug addicts, would steal was bacon and coffee. The reason for this is because it is easy to conceal and they can sell it on easily. This is not evidence that the middle class is stealing to feed their families. Kenb,many of the nurses were from the Highlands and usually had a bit of cash so it was always Bacon,eggs and tattie scones in the morning. Hi, whilst I do agree with the fact that theft is theft and sympathize (particularly with the ex serviceman) .Tesco and other stores are making huge amounts of profit and should plough some of these back into the community, with cheaper prices. And I dont mean their value items which can be very poor and not that much cheaper in some cases. I have no sympathy for them at all. I do know people on the breadline and their pensions or allowances in no way keep up with inflation. Maybe we should all look at a fairer answer on this side of the argument, I know some people are finding it hard to survive, never mind pay inflated prices for essential food. While supermarkets are rubbing their hands with their greedy profits. P.S. I have never stolen anything and have worked hard all of my life but I do feel compassion for those poorer off than myself not for the supermarket giants who along with the government force some (not all ) into this end.